RCA DTA800 series digital converter box remote codes. 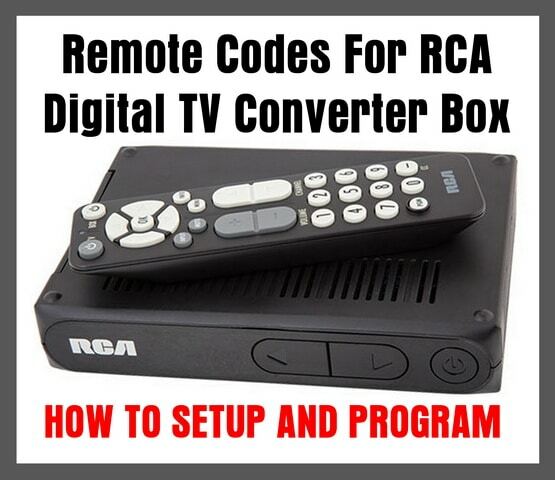 Here is a list of remote codes and how to program the RCA Converter Box. These codes can be used to control your TV with the RCA converter box remote control. You can control TV sets of all major brands after programming the converter box remote control with the PGM (program) key. RCA TV sets can be controlled directly without programming. 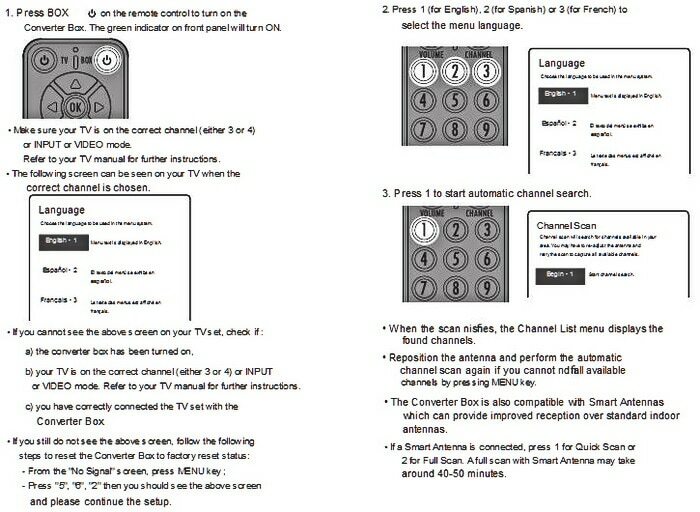 Here is how to set the RCA converter box up to your TV, and how to program it to your TV (with all TV remote codes). After the RCA Converter Box is setup, refer to the TV remote code list below to use the RCA converter box remote on your specific TV. If the remote does not control your TV, try another remote code for your TV brand. If the signal indicator remains lit after blinking four times then you have entered the wrong code. Make sure you have correctly entered the code for your TV brand. If you can use your TV remote control to turn on your TV set, select input source and control the volume. -Try to reposition the antenna. -If the signal is still weak, a more powerful antenna may be required to boost reception for the Digital TV signal. -A Smart Antenna is recommended. -In the menu, press 5 for Settings and then press 1 for Channel Scan. -Turn on the converter box (pass through mode) and be sure cables are connected correctly. -Unplug the AC power cord and plug it back in. -Make sure the converter box is turned on. -Make sure the connections between the converter box and TV are properly done. -Choose different channels or video inputs on the TV set until the picture appears. -Make sure the TV sound is not muted. -Make sure the batteries are inserted correctly. -Replace the batteries if they are exhausted. -Remove any obstacles between the remote control and the converter box. -Make sure you have correctly selected the audio settings. -Choose “Ratings” in the main menu and input the master password “3308”. Need help? Leave your question below and we can assist with helping you setup or program your RCA Converter Digital Converter Box. I have an RCA DTA880 converter box and an RCA RCR503BZ remote. I can not get the remote to control the converter box with the code listed in the pamphlet that came with the remote. (1442) I also tried the PROGRAMMING WITH CODE SEARCH, it only lets me push the power button about 60 times and the remote shuts off. Help please. i recommend you use Avdshare Video Converter to Convert any video to LG TV, Samsung TV, Apple TV, LG TV, Panasonic TV and etc on Mac or Windows computer. I just purchased a GPX tv and do not see any codes in the RCA programming guide for GPX. I have connected the box and was able to pull in the channels, use the RCA remote to turn on and off the RCA box and change the channels. I am not able to program the RCA remote to change the volume or turn the tv on and off. In researching online, I read that the SONY codes should work as GPX is a lower end tv for SONY, but I have tried them all and none have worked.